Matthews housing report/video for March 2019. Home prices in Matthews, NC continued to increase in March 2019 with average home sale prices up 14.5% compared with March 2018. Homes were selling faster with average and median days on market decreasing compared with one year ago. February’s increase in new listings no doubt contributed to an increase of 45.8% in pending sales. New listings and inventory were down in March 2019. Virtually no negotiating room for buyers on Matthews homes with sellers receiving 99.4% of asking price. Matthews housing market update/video for February 2019. February home sales increased significantly in Matthews in February 2019 with double digit increases in both pending (+26.2%) and closed sales (+24.3%) compared with one year ago. A huge increase in new listings of 54.2% increasing inventory by 10.1% no doubt contributed to the increases in pending and closed sales. 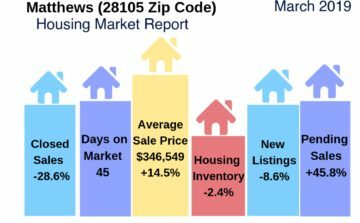 Despite the increase in new listings and inventory, the months supply of homes was still low in Matthews in February at 2.1 months, keeping the 28105 zip code a seller’s market. Matthews Housing Market Update/Video for January 2019. January home sales in Matthews, North Carolina saw continued, significant home sale prices increases compared with the same month one year ago. Market inventory remained tight despite a slight increase and the months supply of homes at 2 months indicated a continuing seller’s market. Closed sales were down, but pending sales, as well as new listings, were both up. Lack of affordable inventory can be considered a contributing factor for the drop in closed sales despite a large increase in new listings. Matthews Housing Market Update/Video for December 2018. December home sales in Matthews, North Carolina saw continued home sale prices increases. Market inventory remained tight and months supply of homes at 1.9 months indicated a continuing seller’s market. Closed and pending sales, as well as new listings, were all down by double digits in December. Lack of affordable inventory can be considered a contributing factor for this situation, as well as the holiday season slowdown. Matthews Housing Market Update/Video November 2018. November home sales in Matthews, North Carolina saw continued home sale prices increases. Market inventory remained tight and months supply of homes at 2.1 months indicated a continuing seller’s market. Closed and pending sales, as well as new listings, were all down by double digits in November. Lack of affordable inventory can be considered a contributing factor for this situation. Matthews, NC housing market information updated for October 2018. Home sales in Matthews, North Carolina (28105 zip code) saw home sale prices continuing to increase, while average days on market stayed flat. Market inventory remains tight, dropping by 2.1% and with just 2.3 months of inventory. Matthews, NC housing market information updated for August 2018. Home sales in Matthews, North Carolina (28105 zip code) saw home sale prices continuing to increase, while days on market continued to decrease. Market inventory remains tight and buyer demand continues to exceed supply. Matthews, NC housing market information updated for July 2018. Home sales in Matthews, North Carolina (28105 zip code) saw home sale prices, pending and closed sales all increasing. Market inventory remains tight and buyer demand continues to exceed supply.